For anyone who has struggled to keep fruit hanging in a sukkah, help is here, courtesy of a woman in Arkansas who did not know what a sukkah was two years ago. 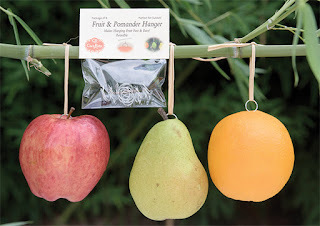 Teresa Clark, who came up with the new sukkah fruit and pomander hanger, is a Little Rock native who moved to Rogers to be closer to her husband’s family. Two years ago, she was making pomanders, a centuries-old practice of putting whole cloves in oranges or other fruit to hang as a decoration and to scent the home. She tried to tie traditional ribbons around the pomanders, but the slick round sides and weight made her efforts fruitless. After much struggle she finally got them to stay. “It was a chore,” she said. But her careful work lasted only until her son came home from school and they became instant tether balls, sailing across the room. Inspired by her husband’s fishing hooks, she started experimenting with different ways to hook into the fruit. The first efforts were promising, though unsuccessful, as the barbs were too small to hook the fruit and the hooks were too sharp to be safe in households with small children. Working with pliers and paper clips, she eventually came up with a spiral-shaped insert to hang fruit, and a product was born — but not one that she figured would be of interest to many people. Each spring, the local school has a World Experience Day, and that year Israel was the focus. Clark explained that the school is transformed into the featured country and there are student art projects incorporated into the displays. Her sister was in charge of doing a sukkah as part of the display of a traditional Jewish household. “She recruited me. To be honest, I didn’t know a lot about the Jewish faith and traditions” and they had no idea what a sukkah was. If they were using real fruit, she thought, she could use those hangers she had invented. She learned that in a sukkah, one typically uses real fruit — so they did. Having experience with the process of patenting and marketing something new after her husband invented a fishing lure a few years ago, she went to work. She decided to try and market the product, and looked online for Jewish craft stores. She contacted a large Internet Judaica site based in California, but the owner was in the process of retiring. She was referred to J. Levine in New York, one of the largest Judaica stores in the country. While J. Levine was interested, for a small inexpensive product it only made sense if it came through a distributor, and they suggested three that they use. Alef to Tav in Brooklyn was interested and now distributes the hooks through the New York area. Next year, she plans to start marketing earlier, so gift shops and Judaica stores can carry them before Sukkot. Currently, they are available at several stores in the New York City area, and in the Fayetteville-Bentonville area. They are also at Gifts of Arkansas and 4square Café and Gifts in Little Rock. They are also available on her website, along with her pomander crafting kits. A package of eight reusable hooks is $2.49 plus shipping.